What does it mean to leave a legacy? When people we love pass away, they leave us with memories, but they often leave us with tangible gifts, too. Those may come in the form of family photo albums, letters, or journals. If we’re lucky, they leave behind important traditions that stick with our families for generations. Food has a way of bringing people together … during times of great happiness, celebration, or even sadness. On the landmark days in our lives – the ones that stick strongly in our memories – we can often recall the meals we shared and who we shared them with. And many of us can remember the special dishes our parents or grandparents prepared for us. In my family, it was Grandma’s bread rolls that signified togetherness and warmth. We could smell them baking on Christmas morning, and we’d slather them with butter and strawberry jam before opening presents. My first memory in the kitchen was standing on a stool at Grandma’s side, watching as she pulled perfectly uniform balls of dough through her fingers, and attempting to copy her technique with my own untrained hands. Still today, long since my grandmother has passed away, baking bread is my small way of filling my home with comfort and love. I look to her techniques as I learn new recipes and try to perfect old ones. Always, when I bake bread, I think about her, and I imagine myself as a child, standing on a stool and breathing in the importance of that moment. The history of recipes in my family contributes to occasions big and small. When we make the same oatmeal cookie recipe we’ve been making forever, we talk about how I prefer them with only chocolate chips, Mom and Dad prefer them with chocolate chips and raisins, and my aunt prefers only raisins. (She once told us she doesn’t like that she can’t tell, by sight, the difference between the raisins and the chocolate chips.) When we make spaghetti sauce (an old “recipe” which includes almost no exact measurements), we talk about how different members of our family have adapted the sugar content over the years. New traditions have formed over time, as well – traditions that I’ll pass down to my children someday. Our favorite gingerbread cookie recipe is reserved for the day after Thanksgiving. Our meatless barbecue sandwich recipe is best served on football game days. And individual homemade pizzas are the perfect activity for bringing a new boyfriend or girlfriend home for the first time. The importance of recording and remembering these recipes can be enormous in creating a lasting legacy for the people we love. Now, at the beginning of a time of year when food is at the center of practically all we do, we recommend starting to collect and share your family’s most important food memories. This can be an easy or difficult task, depending upon the records that already exist within your family. In mine, we were lucky that most of our favorite recipes had already been recorded. Some of them, like the spaghetti sauce, were rather vague, and we’ve worked together to determine measurements on our own. All we needed to do was make a detailed list, organize the recipes, and compile them. My mom made my siblings and me the most incredible Christmas gift when she pulled all of our family recipes into a single bound book with space for future additions. In other families, the best chefs among you may not keep detailed notes about the dishes they make. In these cases, your interviewing skills will become most useful. Ask your family member if he or she would be willing to attempt to record a detailed recipe for you, or even watch the next time they make the dish and record the recipe yourself. It might take some work, but chances are the results will be worth the effort for you and your family. If you’re collecting recipes into a book like my mom did, you can find resources for getting started at the following links. These make wonderful gifts that will be treasured for years to come. Cookbook and recipe software resources – While definitely not required, there are some really great software options for compiling recipes these days. They make inputting ingredients, photos, and formatting a snap. Making a cookbook using Microsoft Word – This Instructables tutorial walks you through how to format and organize a recipe book without special software. How to update old recipes – Older recipes sometimes contain ingredients or processes that are rarely used in modern kitchens. This blog post contains some great tips for using old recipes today. We recommend also saving a digital version of your collection in case the hard copies are lost or destroyed. (Any regular cook has spilled sauce on or burned the pages of at least one recipe book in the past.) My mom turned each recipe into a file that was uploaded to an online sharing space. Now everybody in my family can access all of our recipes even when we're not at home. 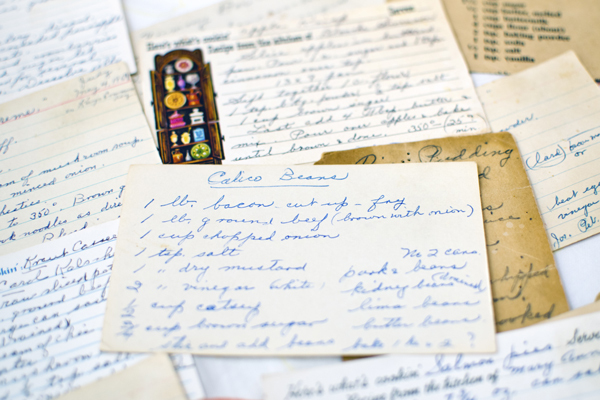 Finally, while there’s certainly something to be said for updating old recipes to make them novice-friendly, there’s also something to be said for paying homage to the originals: the old stained notecards on which Grandma’s beautiful penmanship lists all ingredients in “pinches” and “scoops.” Scanning and digitizing these mementoes in the same way you would old photos and printing or saving them will ensure that the character that accompanied the recipe isn’t lost forever.